U.S. Army Cpl. Shaun Armstrong, of South Carolina, assigned to Focus Targeting Force, 4th Brigade Combat Team, 25th Infantry Division, secures a landing zone during an air assault mission during Operation Champion Sword on Aug. 2, in the Khowst province, Afghanistan. Operation Champion Sword is a joint operation involving Afghan national security forces and International Security Assistance Forces and focused on specific militant targets and safe havens within Sabari and Terezai Districts of Khowst province in eastern Afghanistan. Welcome to Episode 140 of the AR15 Podcast. On this episode we’re talking about how to see in the dark. We want to let you know about a new source of cool products! Please go to http://patriotpatch.co/ to pre-order the Huckleberry patch and buy FRN stickers. 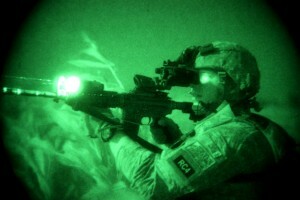 What do we mean by Night Vision? What do we mean by Generation? Gen 1 NV: use an intensifier tube that amplifies ambient light by accelerating electrons and striking a phosphor surface just like a Television, Most Gen 1 equipment uses similar technology and thus image tube performance does not vary too much between similar Gen 1 products. What does make a performance difference in Gen 1 products is the quality of the lenses, the controls, and the devices’ design. Gen 2 NV:add a micro-channel plate that multiplies the number of electrons before they impinge on the phosphor screen, thus increasing gain. Gen 2+, Gen 2ST : This is base quality Gen 2 that is a huge step up from Gen 1. Comparing base level Gen 2 to Gen 1 would be like comparing a motorcycle to a bicycle – they both have 2 wheels but that’s about it. These image tubes will have more imperfections and lower performance than higher level Gen 2 gear. These are known as standard Gen 2 or standard tube. Gen 2CGT, Gen 2MS : This level of Gen 2 is a good choice as they are cleaner and generally perform better than base Gen 2 but usually don't cost much more for the increase in quality. These are sometimes referred to as custom grade tubes or mil-spec grade. Gen 2HPT, Gen 2HP : This is extremely good Gen 2 equipment. Big step up from the two lower grades of Gen 2 in performance, getting very close to Generation 3 performance. However the price of this high level of Generation 2 gets very close to some Gen 3 and with the much longer life expectancy of Gen 3 image tubes, the Generation 3 is often the better choice. This Gen 2 grade is called high performance tube or just high performance. Gen 3 : This gets you the real deal, Gen 3. These will usually have more imperfections/blemishes and lesser performance than the higher levels of Gen 3 however they still give great overall performance and will last you about 10,000 hours plus, which is much longer than the lower generations. Gen 3ST : These Gen 3ST image tubes are technically at the same grade level as Gen 3. However from what we have seen of these image tubes is that they tend to be a bit nicer in terms of less blemishes. These tubes are a great buy for low cost Gen 3 when available. The only problem is, they are not autogated/pinnacle tubes. Gen 3A : This is a better grade than standard gen 3. The image tubes will typically be clearer and they will usually come with image tube data test sheets (detailed test data on each image tube). Gen 3P/Gen 3AG : These tubes are like Gen 3A tubes except that they have autogated power supplies. They allow for vastly superior performance in light polluted areas. This grade/type of image tubes is what's currently used by our US military and special forces. These are what we prefer to use as they work great in all lighting conditions, including dusk and dawn. These tubes are often referred to as Pinnacle or Autogated. Gen 3 with HS : HS is our abbreviation for hand selected image tubes. This is an option that you will see on some of our Generation 3 equipment. This is the absolute best in night vision equipment performance. Our hand select quality image tubes have a minimum Signal to Noise Ratio of 27 or higher and extremely good clarity. The Signal to Noise Ratio is the best indicator of how well the device will see in low light and the higher the number is the better. Less than 5% of Gen 3 image tubes meet our strict hand selected standards. These tubes are stronger and clearer giving you better performance in low light, which in turn gives you longer distance capability. If you are looking for the absolute best performance possible our Hand Select image tubes are it. Gen 4 NV: (GEN 3 FILMLESS) GATED/FILMLESS TECHNOLOGY represents the biggest technological breakthrough in image intensification of the past 10 years. By removing the ion barrier film and “Gating” the system Gen 4 demonstrates substantial increases in target detection range and resolution, particularly at extremely low light levels. This is a tricky one as technically there is not really a Gen 4 classification, according to the US Army. When it was initially introduced the US Army recognized the Gen 4 technology classification. However, after testing reliability and lifespan of the Gen 4 the Army determined that this technology did not meet their strict requirements and thus recanted the Gen 4 definition. So what does this mean for someone looking for the best equipment they can get. In terms of performance Generation 4 equipment is equivalent to or better than most Gen 3 autogated. However, the very nature of the 4th Generation technology makes it more prone to failures and reduces its life expectancy as compared to quality Gen 3 equipment. For our money we use HS (hand selected) Gen 3 autogated models. Although some people feel that Gen 4 gives a little better image, it is really a bit of a toss up and it often comes down to which unit has the better individual image tube. Seth Mullins If you could talk about the clip on style night vision I would greatly appreciate it. I'm running a sightmark ghost hunter monocular with a clip on mount on my 1.5-6x32 scope. I've been told that mounting on the front will throw the zero off but when I mount it behind the scope the image quality is very poor. A rep from sightmark couldn't clarify and if anyone has experience with it, any info is awesome. Mike Kyle It would be great to see a range of NV talked about from the budget minded guy to the guy who has the most toys wins type NV. I myself would love a decent priced piece that would allow me to snipe pests around my chicken coop @ 75 yds or less.